How to say what needs to be said? Astute readers will have noticed the slight change in the title and header of this blog, from "Bad Pennies: They'll come back as soon as they're ready," to a more singular variety. That is because, as of today, I am, as they say, on my own. I started this blog when Craig and I moved to Australia, to keep in touch with Atlanta-based beloved people. And over the last three years, it has grown, and it has reflected nearly every shift in our lives. And I have grown. And Craig has grown. And we are no longer who we were when we set off on an adventure called Australia. So, this blog will now reflect this shift in our lives. We are each on our own. Happier posts coming soon, I promise, dear dear readers. 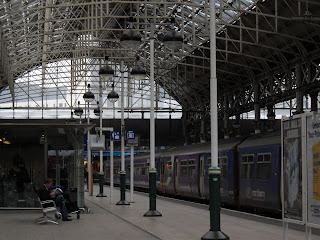 My trip to Manchester wasn't all relaxation and train-station-based theatre, my friends, oh no. It was also a serious business trip that had me visiting the Photon Science Institute to have a stickybeak, meet prospective collaborators, give a presentation and paint myself as generally competent and good drinking company in case they feel like handing out postdoctoral appointments soon. And so on Wednesday we set out for the uni in classic Craig fashion, i.e., unsure of where the building is, exactly, and what it's called. Fortunately I had my contact's number written down and we didn't have problems. In short, the visit was very good, and my presentation was fine, and Nija, ever the fan of science, came along too, wearing her new T-Rex necklace. Nija sat down in the third row or so, amidst the people of the Institute. G: (smarmily, eyebrow cocked) Heh-looooo, are you a student at the Institute? N: (chipperly) No, that's my sweetheart up there! The ginger! G folds his arms and slumps into his chair. N: So are you a student here? What do you do? G: Nothing. It's complicated. Whatever. Mumbles. A true slice of life! Oh well, can't win them all. 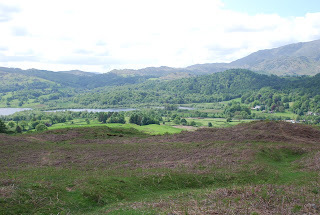 Anyhow, we set out after the visit to one of England's classic destinations, the Lake District (or possibly the Lakes District), famous for astounding scenery, quaint villagelets and rakish authors who died more than a century ago, like Wordsworth and Thomas de Quincey. It's about an hour north of Manchester, so in Sydney terms it's in metropolitan Manchester. We set out on our journey in classic Craig fashion, i.e., I had looked at the map (as we sat in the car before leaving) and kept telling myself the numbers of the motorways we needed to take, but didn't write it down as I thought "It's only two numbers, how can I forget?" Well, first we got stuck in traffic (or we participated in traffic, as it were) on the Ring Road for an hour just trying to get to the other side of town. Second, all the motorways leaving Manchester are sixty-something, so I just basically got mixed up between 61 and 66. A good 30 minutes into our journey up the 66, the thing terminated and put us onto a surface street. I was trying to get to the M6. Something was amiss. Nija had to drag out the map, which she hates being responsible for, and I wound up agitated and not very friendly about getting us to the 61, so we could get to the 6. It wasn't pretty, and I was sorry, and I encourage you to write things down, reader, lest you wake your partner from a pleasant doze to give her bad news and then have her fix it. We did get to the 61 (thanks, darling) and then to the 6, and then wound our way up past wind turbines and through lovely countryside into Cumbria and the hamlets of the Lakes. Fortunately, summer was on its way to the North and so it was light out until about 10PM---fantastic---so even though it took us twice as long to get there than expected and even though we'd left in mid-afternoon, we could still take in the epic landscapes and mirrored surfaces of the lakes, meres, tarns, sluices, estuaries, wassers, fjords, estanques, pozos, billabongs, and whatever else they call ponds up there in that part of the shop. 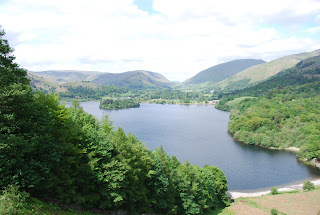 On a friend's recommendation, we planned to stay in Grasmere, a village about 20 minutes beyond Windermere, "the Katoomba of the Lakes". We got there and checked ourselves into a comfortable guest house, headed into the dark for a pub meal, then returned with wine. Next morning we were surprised to find that someone had been making sacrifices to the god of good weather; despite the rainy week we'd had in Manchester we got one of the Lakes' elusive beautiful days. 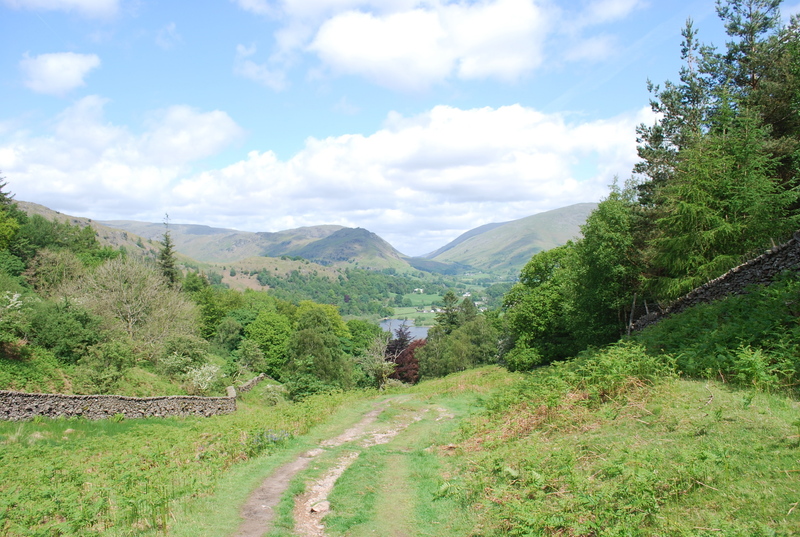 We packed up some of the food we'd brought from the city, had some breakfast, picked up some maps, and headed out according to one of them on a several-hour walk around Grasmere lake. Fifteen minutes later, we still hadn't gotten out of Grasmere, because we couldn't figure out where, exactly, the map was telling us to start. I suppose it was more of a set of vague instructions than a "map", per se. Eventually, thanks to the help of a kindly hotel receptionist, we were on the right track. It was indeed an excellent walk, and by the time we got back to Grasmere we were in need of some tea and cake, which fortunately were available at the tea and cake shop. 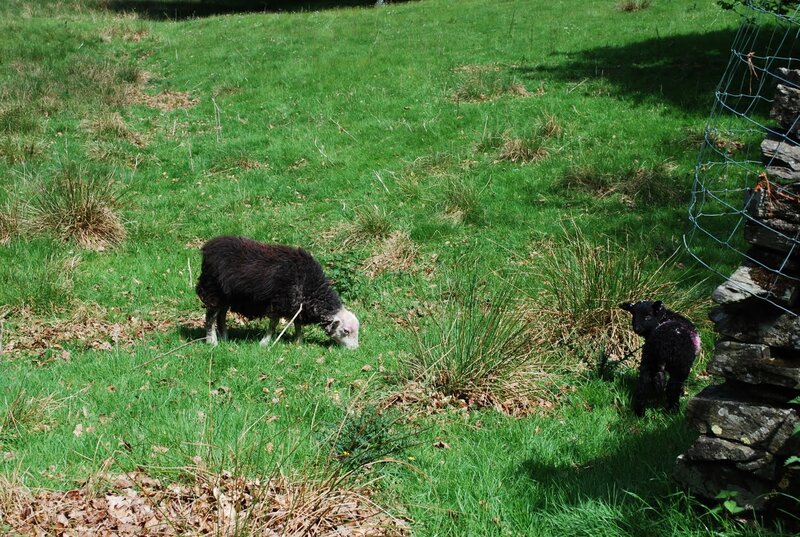 Afterward we grabbed our car and toodled up toward Penrith, capital of the Eastern Lake District. 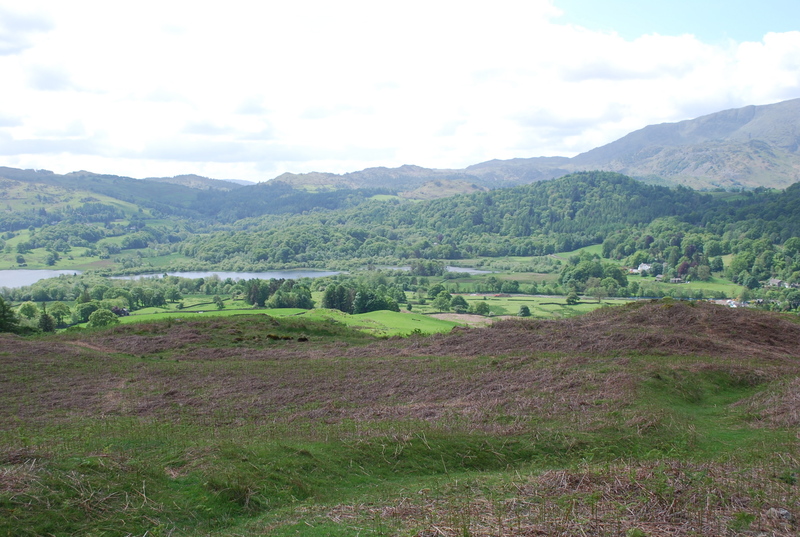 We were hoping for a scenic journey, whatever the destination, and my choice of a tiny little squiggle on the map to get there paid off big-time, with some harrowing driving and frankly unbelievable views. It doesn't make for good blogging, though, since we didn't take pictures; we just sat agog at the immensity and diversity of the landscape, from green pasture-lined hills to sharp, craggy, dusty ranges, all in the span of a few miles. We made it to Penrith in one piece. For our Australian readers, this is the original Penrith we're talking about here, and let me tell you that it's quite an honour to set foot in the place that inspired our own mountainside metropolis. One can see why some voyager might have longed for his home such that he decided to spawn a new one. There is a nice clock tower. And note this in your travel journals: not a pub in Penrith has macaroni and cheese. We checked. But they do serve beer, and hot chips, and so we tucked in, and watched Obama give a speech without the sound on, and we headed back to Grasmere for a quiet night. What is a train station? Before Craig got here, a friend of mine asked me what Craig and I would do. I listed the knowns: spend time introducing Craig to my new friends, go to the Lake District, go to Mossley and see Acorn's Antiques. I said there were unknowns, too. My friend said, "I thought you'd just spend all week in bed." I laughed. "Right," I said, "We're not really that sort of people." In the ten short days that Craig was in Manchester, we did many things. Some might say too many. For example: on his fabulously rainy last day, we went to the Manchester Art Gallery. But no one could possibly question Station Stories. 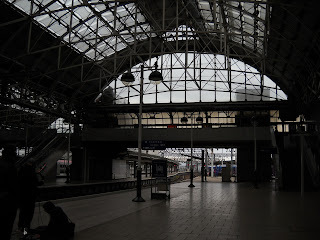 Piccadilly train station is, perhaps, not quite at the centre of the city, but it is Manchester's main train station. Its current incarnation was built in the 60s, and as such, it is an enormous glass structure. In its own way, it can be beautiful. It is modern, with digital arrival and departure signs. 12 train platforms, as well as the Metrolink light rail platforms below. It is also a mall, housing Starbucks, Monsoon, TieRack, and the only Manchester branch of the enormous UK chain The Bagel Factory, which sells and promotes bagels as "America's best kept health secret!" Indicating, of course, a nearly complete misunderstanding of bagels, Americans, and more generally, perhaps more sadly, health. But what is a train station? For the most part, I think, for most people, a train station is a waiting place. A place merely designed to take you from home to a place you want or need to be. It is a place you deal with, a place where you undergo sacrifice of time and pleasure, in order to get somewhere you would prefer to be. Or perhaps somewhere you have to be. A train station is also a public place, where many people have private trajectories. Some are coming home, some are starting holidays. Some are leaving for work, some arriving from it. In many public places, everyone is largely doing the same thing, in restaurants, most people eat. But train stations are a special sort of public place, with special rules. You do not usually congregate in a train station. You pay 30p to use the restroom. There are special rules. And for the most part, I think, for most people, not a lot happens in a train station. It is a waiting place. It is a getting from here to there place. It is just an in-between place. 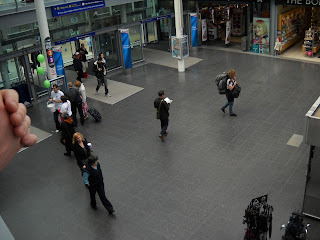 Approximately 12 strangers stand on the mezzanine of Piccadilly Station, looking down at the ground floor. Imagine you are watching the amorphous crowd. You stand, watching, picking out individuals as they make their ways through the station. This one has an enormous backpack. Maybe she's on her way to the trip of a lifetime. Maybe she's just returned from it. Maybe, just maybe, you think, Manchester is part of it. You and approximately 11 strangers are not only standing on a mezzanine and watching. 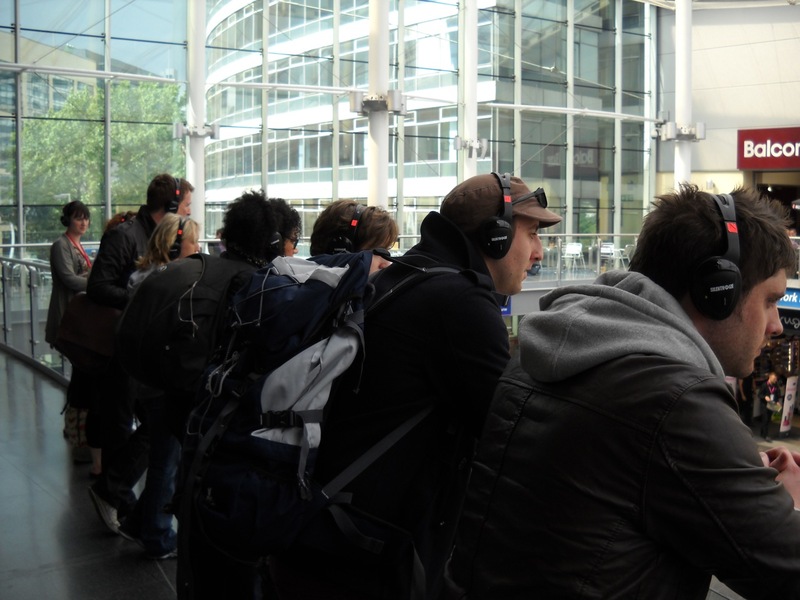 You are all also wearing headphones, making you look, if anyone cared to look, like a group of very special people. 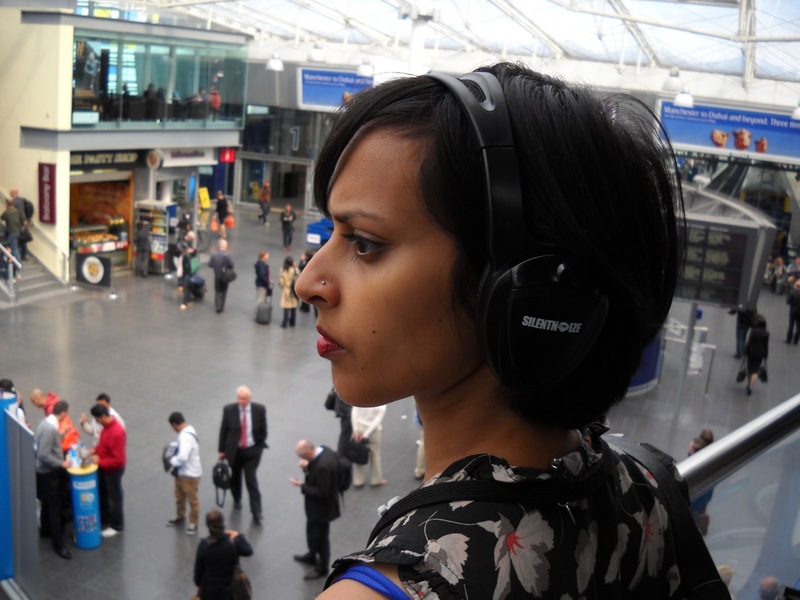 In the headphones, you hear ambient music, sounds from around the train station. You can also hear muffled announcements, fighting their way into your ears, despite the headphones. And then you hear a man's voice, very nearly inside your head, telling you the story of the girl he met, loved and lost at the train station. You hear him, but you do not see him. He is one of the crowd. And because you cannot see him, he could be anyone. These thoughts, this story you're hearing, they could be anyone's. Because a train station is a waiting place, that makes it also, strangely sometimes, a thinking place. And any of these people you're watching could be thinking this. Something like this. Eventually, if you pay attention, he makes himself known. He wanders through the crowd, speaking quietly into a wireless microphone, and though you are 50 feet away, you can hear him just as you could if he were in your bed, telling you everything he'd been through with that woman. It feels like he's talking to you. Really, he's talking to you. And approximately 11 strangers. He told us his story, about how she wrote him cards, and how he needed to get rid of them, now that she wasn't his any longer. He tries leaving them around the station these days, he says, but it's hard. People are always noticing, giving them back to him. "Hey, mate! You dropped this!" And as in his story, so in real life. You and approximately 11 strangers are the only ones, you see, who know he's trying to drop these things. And you are unnoticed. You are 50 feet away. There are many people in this train station who are there merely to wait, and they do what people do. Mostly, they do not notice. They do not notice him dropping his love letters, and they do not notice approximately 12 strangers watching them, with headphones on. But some do notice. "Hey mate," they say, in entirely good faith. "You dropped this!" He takes the card back, and thanks them for noticing, and continues telling his story and drops the card again. And you stand there on the mezzanine and listen to this private story unfold. You watch and hear this performance, performed for an intimate audience: only you and approximately 11 strangers. Is a train station, then, a private place? Or is a train station, then, a theatre? We heard six stories that day, performed by six writers. 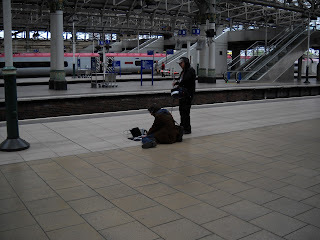 They performed at different parts of the station, and we walked to varying areas to hear and sometimes see them. David Gaffney, Nicholas Royle, and Jenn Ashworth were especially memorable, perhaps only because I had already heard of those writers. Or perhaps because I could, in some way, relate to the stories they told. There was a very obscure sort of poetry by Tom Jenks that was difficult to hang onto because I could not read his words as he said them, and his words were sometimes tricks, as poems can sometimes be. There was a conspiracy tale about the Masons. 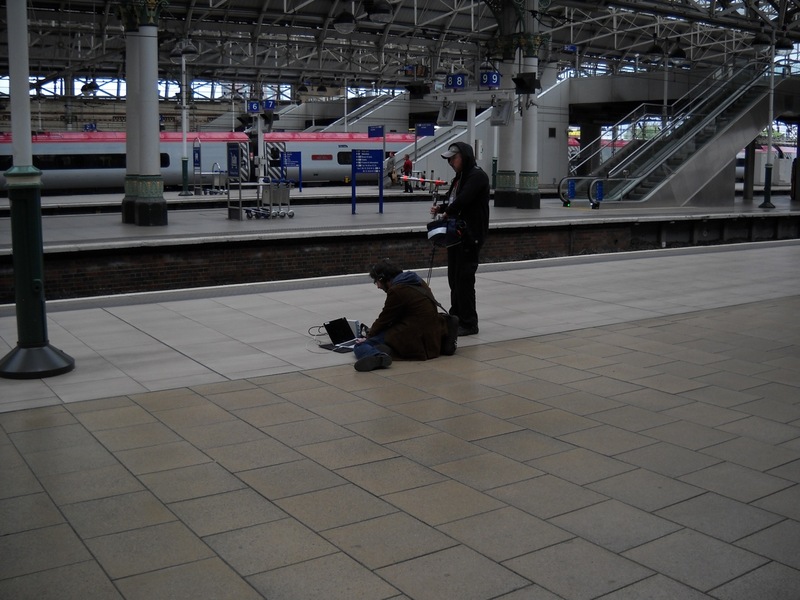 Their stories were live-mixed with music and sounds from around the train station. Very cool technology was used to transmit the live-mix to our headphones. It was futuristic. No. It was the future. I think this because Station Stories, in a way, raised almost too many questions for it not to be the future. When you really start thinking about them, they are truly strange places. They are never fully closed, so there is never really an "inside." They have doors that demarcate inside and outside for people. But the doors for the trains are always open to the outside. Perhaps it makes sense for them to mix public and private like this, to be so ambiguous. For Station Stories, the thoroughfares were the stage, sometimes. And sometimes the dead spaces of the station were the stage. Is it ok to have people to unintentionally become part of a performance against their knowledge and/or will? Or where is the line between art and life, and are we allowed to find them and trample on them in this way? Are we not allowed? Who lays down those rules? What is a performance? And who are performers? The writers, surely, were performing. Traditionally. But what of the strangers who didn't know what was going on, and yet still played by the special rules of the train station, by refusing to let a man drop a card and keep walking? What of them doing what was expected? What of the others who ignored the cards, who didn't notice the cards? What of them doing what was equally expected? And more to the point and to the problem questions. Occasionally people pointed up at the mezzanine, alerting their family to our presence, laughed at the specials, or just looked confused in our direction. We looked back, sometimes. That, too, was that a performance? Of course, individual lives and stories and trajectories are going on everywhere all the time. Only a solipsist could imagine otherwise. Which is too bad, because I feel like I look rather stern and unhappy in that picture. Just about angry. "No," he said. "That's what you look like when you're thinking." Oh, dear. I might need to stop thinking so much, if that's how I look, I said. And he said something sweet, like he does, because he's that sort of person. It was, undoubtedly, loving. The kind of thing he says all the time that I forget quite easily. I'm that sort of person. Two days later, we were back at Piccadilly, this time having a private story of our own in that very public space. He was leaving again, and this time I won't see him for probably a full year, unless we manage something magical. He probably did, but I can't remember if he told me this time that I look beautiful. I don't remember the right things sometimes. I'm that sort of person. This is a footnote, added mere hours after this post was published. 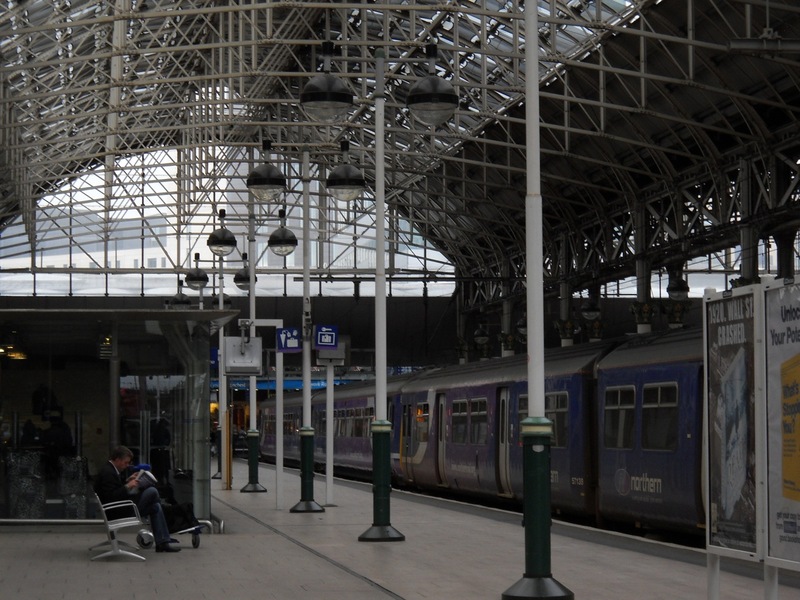 I have twice been in train stations when they became not waiting places. Years ago in Atlanta, I was on my way to a protest against an abomination that is otherwise known as war. I was traveling on MARTA, which is an abomination in itself. I tell you what, it is not "Smarta." Having cleverly deduced that a truly massive horde of protestors (maybe 30 people?) were using public transit to attend the protest (because, I suppose, we were holding placards and banners that said, sometimes, "No Blood for Oil"), the cops shut MARTA down to prevent us joining the massive horde that was already at the protest location. Which is to say, our combined might would have equalled that of... well, maybe 100 people. Protesting isn't that big in Atlanta. We were already on the train, and we were only a few stops away, but now we were locked in. And someone started singing. Not some obvious protest song, not Woody Guthrie or Bob Dylan. Not Joe Hill. Oh, no. No, no. Take my hand, we'll make it, I swear! O-oh! Living on a prayer! I present for your judging eyes, then, dear readers: Bon Jovi as a transformer of space. Craig and I waited on the platform, just a few weeks ago, for the train that would arrive and a few minutes later, take him away. We said our goodbyes, the train rolled in. And rather than him quietly taking his seat, we were overwhelmed by 100s of laughing, cheering, partying, screaming people streaming out of the train. Man City had just won the FA cup. City fans made the train, the train station, the streets into a place of pride.... Craig's train left with him on it, and I followed the party into the train station and out of it, laughing and taking heart in the collective joy that filled the train station.